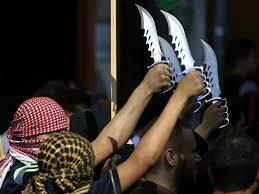 ​as knife Intifada spreads from Germany to France to England and Belgium. Scores of civilians are dead, and more than of two hundred other casualties have been recorded, nearly a quarter of whom have life-threatening injuries, while others will be severely scarred, and not only physically for many years to come. At least one Canadian student from Edmonton, Alberta, thought to have gone missing amid the chaos, was among the deceased, actually. The difficulty in making proper identifications is due the nature of having to rely on forensics, since ordinary visualization was rendered problematic due to the condition of some of the victims' remains. This is heart wrenching agony for those families and friends who are waiting to know, one way or the other. And, it stands to reason that one of the forms of assistance that our leaders ought to have dispatched to Nice immediately, was mortuary scientists. Yet again, profound grief, a result of an indiscriminate attack on civilians by radical Sunni Islamic insurgents, has gripped all too many families and communities. Prophetic words can afford a small measure of comfort to the many survivors, and we extend our heartfelt condolences to those who now wait in the shadows of despair for that glimmer of hope that will sustain them in the days ahead. 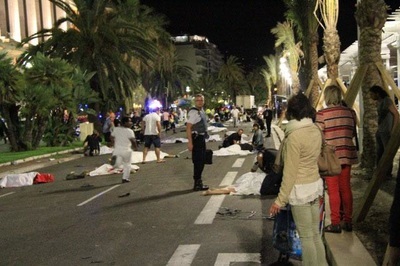 The authorities tell us that the carnage in Nice on a day, since the 14th of July 1880, of festive celebration of the French Revolution, was an unpredictable attack by a lone wolf, who although known to French intelligence, anti-terrorism and the security services, he did not present sufficiently on their radar to warrant anything in the way of special or particular surveillance. Meaning that this attack, like Orlando and San Bernardino, among others, was just one of those things that can happen and will continue to, because self-radicalization cannot be monitored, and attacks that the self-radicalized perpetrate are invisible to prevention. In a phrase, the problem lies not with the intelligence and security services. That statement, that belief, as we shall discover, is pure unadulterated, rubbish. It is beyond the scope of this article, but Orlando, San Bernardino, Brussels, Paris and now Nice were not the acts of a lone wolf, but jackals. The Nice perpetrators are clearly Salafi, and the Salafi are actively undermining the Arab Spring in Tunisia (where it all began), Libya and are posed to be the dominant force as and when the dust settles and clears in Syria. 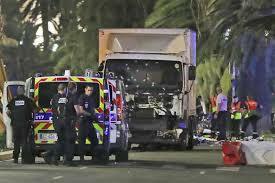 The individual attackers whether they are in France, Belgium, the United States or Canada, increasingly see themselves as mujaheddin. Thereby, embracing mujaheddin lore as those who successfully attacked the United States, and defeated the Soviets in Afghanistan. This also allows for a kind of universal kindred spirit that sees the Al Qaeda as the wellspring (the ultimate source of inspiration) that sustains the coherency of international (worldwide) radical Islamic Jihad. And, in that sense, all the talk among western intelligence and security services about lone wolves, the Islamic State, etc, etc, is meaningless. There is one force that is predominant in radical Islamic insurgency, and it is worldwide. The idea of being mujaheddin, is the dominant ilk within radical Islamic thinking in Indonesia and throughout South East Asia, Central Asia, Europe, Africa and in the Americas. Obama stated, after Trump accused him of not being willing to use the term radical Islam, that using the term would not change anything because we know, according to the president, who the enemy is and who we are fighting. Well, the reason we use precise language is to describe one thing and so it is not confused with another. The attack in Nice was not a lone wolf, but a jackal. 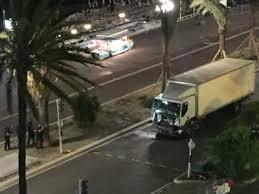 The lone wolf theory fails as the arrest of multiple players in the Nice attack come to light. The lone wolf is a different presentation altogether, and if we call those who are clearly inspired and have provable and direct contact with mujaheddin makers, then we blind ourselves to the craft of the lone wolf when the lone wolf emerges, as is inevitable. The mass murderer, Sonboly, on the other hand, exhibited the craft, skills and characteristics of a lone wolf. Notwithstanding the fact that German officials have in custody a teenager, who police state may be charged as a 'tacit accomplice', that is, a person who knew of a planned crime and failed to report it to the police. It does not seem however that the teenage accused accomplice was involved with the months and months of planning that went into the mass shooting, nor with the purchase of the gun on the dark internet, or that the teenager knew of the connection between the date of Sonboly attack and mass murder in Norway. Or just how actually disturbed Sonboly was. As a neighbour described him, as being too quiet. And, naturally as a Shia Muslim, Sonobly was not caught up in the wave of Sunni radical Islamic jihad that has made targets of Shia Muslims, in every country where there is a sizeable Sunni majority. The FBI not understanding the nature of the interaction between Mateen and the Wahhabi in Saudi Arabia, does not mean that it was not important, it just means that they would not have a clue as to what they should have been asking Mateen about his trips to Saudi Arabia, and his interactions with the strict Sunni Muslim Wahhabi sect that controls Mecca and Medina. One might begin to understand the association between the state and religion in Saudi society with the phrase, the Wahhabi hold up the sky that the government rules under. And, as we witnessed in Turkey recently, Muslim societies exist from Friday to Friday. If the Mullahs and Imams are in favour of the government it survives, and if not, it perishes. The Mullahs and Imams called the faithful out on the streets to save the current regime in Turkey. Had they decided it was time for the regime to go, well, as stated Muslim governments exist from one Friday to the next Friday. In fact, after 2011 and Mateen's second trip to Saudi Arabia, his increasingly erratic behaviour can largely be explained by his approaching due date, the moment when he was committed on the ability of his mortal soul to enter heaven to act, to kill Americans, non-Muslims. And, all of this was set in motion through his direct contact with the Wahhabi over a two year period. Those interviews that the Orlando attacker had with the FBI, remembering that the attacker was brought to the attention of the FBI by his co-workers who felt that certain things that he had said were to them so threatening that they took the extraordinary step of actually contacting the FBI to inform them of what they had heard Mateen say. Why, was this an extraordinary step? Well, and this should be obvious, the first person the FBI investigates is the person who brings them information. At that moment they have the person who brought the information and whether or not the information is credible is first determined by their assessment of information provider. The person about whom the informer thought should be brought to their attention, is a secondary matter in the first instance. Eventually, if the initial assessment of the individual who brings information to the FBI is positive, then they will actually look into the nature of the information provided by the informant. And, in reality, this process could not be organized in any other way. But it takes time, and it is fraught with FBI biological prejudice. The FBI interviewed Mateen and concluded that he was not a threat. And, a knowledge of the assessment of the individual(s) who brought Mateen to the attention of the FBI, suggests and it is therefore logical to conclude that the FBI was already leaning in the direction of the entire circumstance was the result of personal enmity between the informer and Mateen, and that no proper and critical evaluation of Mateen ever took place, actually. After the attack in Orlando, the FBI stated that they reviewed the substance of those interviews with Mateen and could find nothing in that material that would have warranted his continued surveillance. What the FBI learned in those interviews was that Mateen had visited Saudi Arabia, Mecca, twice, 0nce in 2010 and again in 2011, and yet given that his visits were in association with one of the Pillars of Islam, the Hajj, incredibly, they found nothing in those visits to prompt them to delve into the true nature of this interactions with the Wahhabi in Saudi Arabia further. The FBI interviewers did not know enough about the Wahhabi with whom Mateen met to ask meaningful questions, no less the right questions that would have identified Mateen as a potential threat, as someone who had made the decision to strike a blow for Islam by orchestrating an attack in the United States. The fact that on those two occasions, Mateen, met with the Wahhabi (the creators and financiers of the mujaheddin and the most prominent backers of the Salafi) meant nothing to the FBI then, or now. And, as such the FBI will always be that agency that investigates after the fact, or stumbles upon plots brought to them by other law enforcement agencies. One must remember, that as we begin to put police forces (all of them, including the federal police) in the United States under the microscope, most senior FBI agents today began their FBI careers under the tutelage of policemen who were policemen during a time when police forces across the United States used dogs and water hoses on anyone who actually wanted the promises of the constitution to be realities in people's lives. Most of the younger group who graduated into employment in the FBI, are reminiscent of the problems that a lack of diversity and diversity training has wrought on too many communities in the United States, that are the subject of the daily news. One must not forget that police officers in Massachusetts were members of the KKK while on the police force, and Donald Trump, the latter day law and order candidate, has chosen a vice presidential running mate from a state that until recently, 100% of all members of the state legislature had ties to the Klan. And, whereas there is anecdotal evidence that the percentage has fallen of late, there is just as much evidence that suggests that association remains very much a problem, in Indiana as well as across the United States. We are told about the progress in the state of Texas, and yet Till's murderers walked free. And, Mike Pence, if he wants to convince a skeptical nation that he can help make America great again, must first acknowledge that what happened in Grant County, Indiana, was evil, and cannot be excused as the onward march of Christian soldiers. We, the public, are beginning to realize that diversity is not a bad thing, and that it is not a matter of outward pigmentation, but it is a state of mind which lends to an adherence to set of principles, which enshrine equality of opportunity and equal standing before the law. But, that is the dream for America, it is not what happens now. What would be interesting, and by interesting this author envisions FBI disclosing enough information to make sound judgements about what transpired. For example, who and at what level of the FBI structure signed off on the Mateen record and agreed with the assessment that he posed no threat to public safety. Those individuals would not be unlike the group of up and coming young Turks who signed off on the information an informant brought to the US embassy in Nairobi about a plot to bomb the embassy, before the embassy was in fact bombed. There was one FBI agent who had a correct vision about counter terrorism, but unfortunately he left the FBI after suggesting that they take a more active and proactive part in terror prevention. Unfortunately, he became the head of security of the World Trade Center Towers and died on 11 September 2001. This author makes that statement for two reasons, first so that the people being addressed in this article know that they are being addressed, and the young Turks who do not have the slightest idea what is being discussed can back off. The best way to describe the anti-terror, counter insurgency personnel of the FBI is to use a conventional wisdom song from the 1960s, to wit: ... they are all put in boxes made of ticky tacky, And they come out all the same, and they all look the same. Mateen to his FBI interviewers was just another ethnic minority, as was the Nice attacker(s) to the French authorities, and the few hours of diversity training they had had was wholly insufficient to prepare them to understand these individuals, and their knowledge of the organisation of Islamic society in general, or radical Islam in particular is sophomoric at best, and otherwise non-existent. Since Brigadier Kitson's seminal work in early 1970s (Low-intensity Operations) that suggested that American and European police forces should prepare for urban guerilla warfare by instituting SWAT personnel and the military tactics and technology necessary to implement it fully (civil rights concerned citizens are in shock as they learned about some of the lethal technology used by Dallas Police Department recently, which the public was unaware that police forces had in their arsenal), the nature of policing away from a community focused deployment has been the norm (However, it must be stated that community policing (bobby on the beat) is the only policing method ever documented to reduce the incidence of crime). Central to Kitson's thesis was that 'good traffic control, was good policing'. That part of Kitson's thesis was immediately adopted by most US police forces, especially in relation to policing African American communities, and by their Canadian and European counterparts in relation to their ethnic communities. Kitson's influence did not stop with the democracies, but controlling traffic as the principal means of policing, became and remains the modus vivendi of the most repressive governments on earth, to this day. And since, driving Black in America has been fraught with danger. So much so, that the memory of being pulled over multiple times, can make one of the longest serving African Americans in the US Congress misty-eyed when he speaks of the many peril-filled encounters. The need for more precise terminology, Mr President, is glaringly absent. Some have suggested that the young Turks within the FBI should be given credit for memorizing the hand-out sheets on the subject from their few hours of exposure to Islamic insurgency matters in the classroom. Unfortunately, those hand-outs will not allow them to appreciate the exacting description of the Nice attacker(s) in the subtitle to this article, Salafi sect influenced jackal of Tunisian origin attacks civilians, lone wolf, Sonboly, goes on year-long planned shooting rampage in Munich, nor the lead sentence to this article: and knife intifada - has shattered German and French sense of security. For nearly two decades, North American and European intelligence and security services have confidently asserted that the knife intifada, known all too well to their Israeli counterparts, could not and would not spread to the Americas and Europe. These same agencies tell us that they are monitoring radical Islamic jihad sites for the messages they contain to recruit those who will carry out attacks against Europeans, and yet here we are. The knife intifada has arrived in Europe. It will take the Germans, whose sense of security has been shattered, just as much as the attacks on 9/11 shattered the sense of security of Americans. But the Germans ought to remember that the final stages of the planning for 9/11 took place in Hamburg, where most of the hijackers had lived prior to 9/11. And that they, the German Federal police, had in their custody in the weeks leading up to 9/11, an individual that told them that an attack on the United States was imminent, and that that attack would 'Change the World'. In desperation, since the American intelligence services were not listening, the German Federal Police actually made a series of telephone calls to the Bush White House, to no avail. When Bush met with the German Chancellor shortly after 9/11 and made the statement that they would never let it happen again, it was those telephone calls and the inability to get the US intelligence service to react that the two leaders were talking about. ​Over the next few weeks after a host of other knife wielding attacks against civilians in Europe, parallels will be drawn between the knife intifada in Middle East and Germany and France. The press will wake up to fact that the dark internet has become the pulpit of Islamic jihad and a discussion of the dark internet will ensue. Tony Blair after meeting Colin Powell for the first time and contemplating his rise to both military and civilian power in the US, returned to the UK and gave a speech in which he asked, I wonder if it could happen here. Well, Prime Minister Blair (ret), that is still very much the question. how can newspapers expect to stay relevant?